It has been replaced by the AntennaCraft 5MS921 HD Antenna!!!! This antenna comes with 15' of Coaxial Cable Included Free!! A $4.95 Value!! 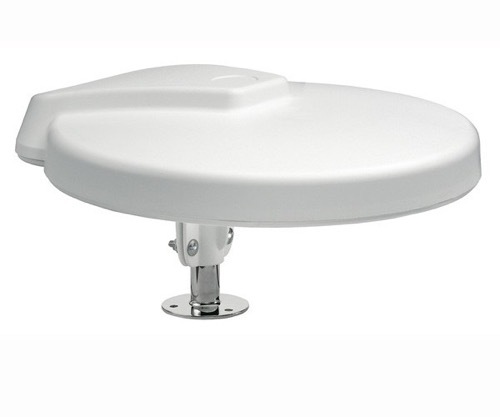 This newly designed amplified omnidirectional antenna, RS-1500 includes a wall plate power supply for amplification. Increase gain to a full +10 dB for weak signals. Adjustment is easy with the convenient control knob, and you can flush or surface mount the control panel. The antenna fits on any 1 inch diameter pipe and one is included. The antenna also has an auxiliary input for cable or satellite. When the RS-1500 is turned off, the auxiliary input is automatically connected to the TV. Aerodynamic antenna has high impact, UV protected weather-resistant housing. Features wall plate power supply with auxiliary input jack for cable or satellite. Fits on aluminum mount (included) or on a 1 diameter pipe (not included). When the RS-1500 is turned off, auxiliary input is automatically connected to the TV. Includes 15 RG-6 coax with F-connectors and 5 18-gauge 12 V power harness. Overall size, length and width: 16 x 14 3/4"
Amplifier Gain VHF: 10 dB avg., UHF: 7 dB avg. Please Note:This product is no longer available. Please Note: It will be substituted for with a direct replacement product.